After missing out on “Big Saturday” (6th April) when 4,218kms were flown, due to being on holiday down in Cornwall, and with the following weekend looking very poor for XC-Scotia attempt three, and with me unable to do attempt 4 on 20/21 April should it be on, I randomly checked the forecast for Chamonix for the 13/14/15 April, and lo and behold it was looking pretty epic! On Tuesday I posted an email to Facebook and the Avon forum signalling my intentions, and by Wednesday I had two takers, Pete Douglas and Guy Anderson. 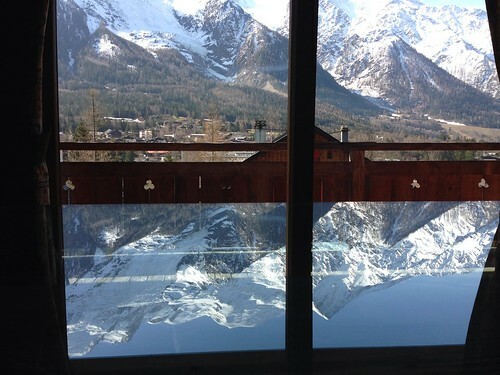 Easyjet flights were rapidly booked, followed swiftly by accommodation at Gavin Foster’s lovely chalet in Chamonix, and by 1800 on Friday we were strapped into our seats on an Airbus A319 heading to Geneva. We arrived at the very comfortable Chalet les Jumelles at 2230 and immediately fired up laptops etc to check the latest forecast and local knowledge for Saturday. X-Alps team Jon Chambers and Tom Payne were planning to go to Planfait (Annecy) so we reckoned that was a good bet, and agreed to meet up at the landing field at about 11ish. 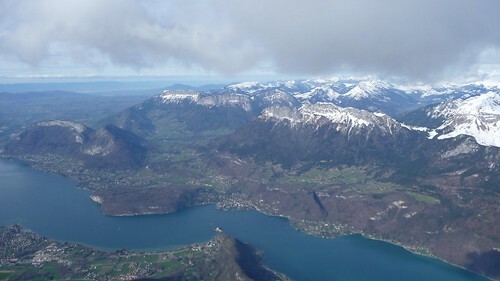 It took all three of us an age to get high and onto Les Dents, but once up there we were treated to the usual stunning views as we flew south towards Forclaz and La Tornette. I shared a beautiful 4m/s climb above Forclaz all the way up to 2,500m with two eagles before heading across the lake to the Rocque do Boeuf. I arrived well above some other gliders and continued southwards along the ridge on my own. I had no real plan apart from to try to head south as far as I could, then attempt to make it back. I got low crossing some of the gaps against the southerly wind, but eventually I found myself some 30km from takeoff at a big southerly facing bowl near the southern edge of Les Bauges above a village called Les Deserts. It was 1630 by this time and I’d been flying for 3.5 hours so I figured this would be a good place to turn round and head for home. I zigzagged up the south facing slope in the gorgeous late afternoon sunshine before thermalling all the way to 2,300m as I got above the hill. From here it was an easy cruise back to the Roque de Boeuf, and I hooked a lovely climb up to 2,400m which set me up perfectly for crossing the lake back onto Les Dents one last time. I could have stayed up there soaring above the cliffs for ever, but after 4.5 hours flying I figured it was probably time to land for a beer and find out how Pete and Guy got on. 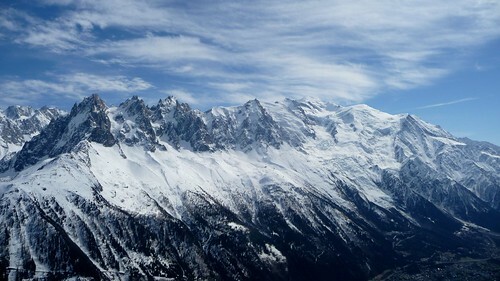 After a suitably refreshing debrief we set off for Chamonix and headed straight to the Jeckell & Hyde restaurant for much needed sustenance, followed swiftly by the obligatory downloading and uploading of tracklogs, then bed! 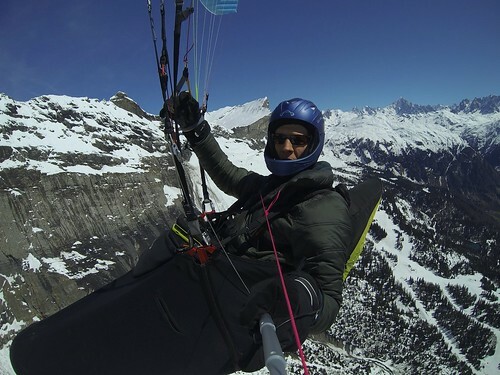 So, that was day 1 (see http://www.paraglidingforum.com/leonardo/flight/738433) – could day 2 be any better? Better? Who knows… Spectacular? Definitely! 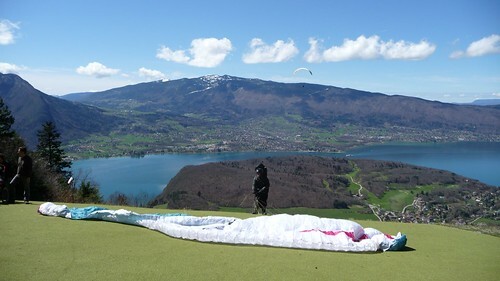 We headed up to Plaine Joux for 1130 and took our time soaking up the beautiful views before taking off at 1230 ish. It didn’t take long to climb out and pretty soon we were all enjoying some spectacular views alongside the big cliffs behind takeoff. Guy and I lost track of Pete so we decided to go for the valley crossing over Sallanches and on towards the Avavis chain of mountains. 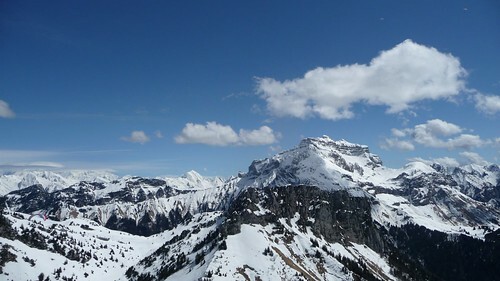 We found a slow climb over on the other side, but there was just too much snow around to generate thermals to allow us to get onto the Aravis itself. 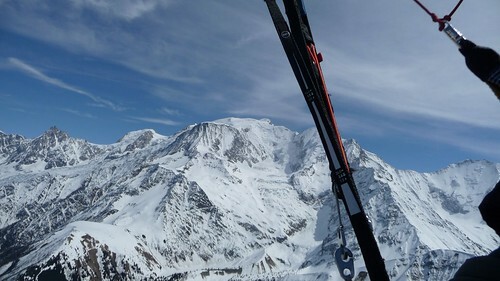 We tried to push south over some of the skiing areas above Megeve however we didn’t have enough height. I decided to push on towards Megeve where I was sure I’d find a climb on the into-wind slope just to the north of the town, whilst Guy (sensibly) held back. I found myself very low over the town and in desperate need of a climb! I caught the faintest whiff of a climb as I flew over a small tree covered hillock and then circles in 0’s and 0.5’s for a couple of kms before it finally took off and propelled me up to 2000m once again. 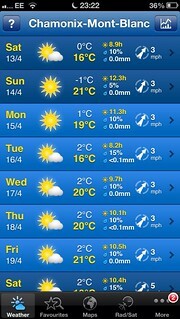 Some good old-fashioned grovelling over Megeve…! 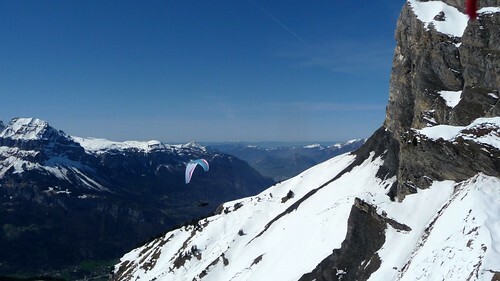 From here the glide across the valley back towards Plaine Joux was easy and I then met up with Pete and we spent a pleasant couple of hours soaring the cliffs behind takeoff again before heading across the valley to the Tete Noire and a little bit beyond. 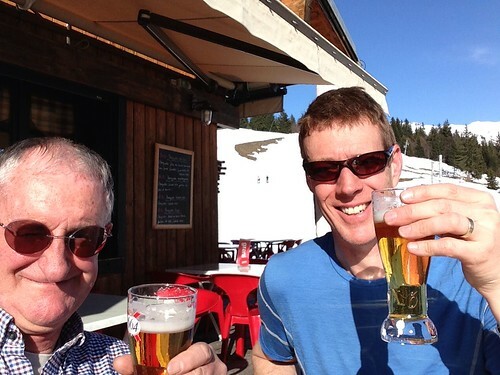 After four hours that beer was calling pretty loudly so we both landed back at Plaine Joux and packed up in the snow. 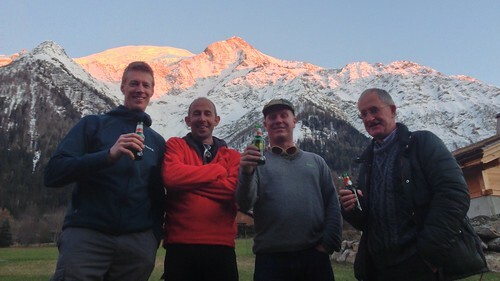 So, a great end to another fantastic day – thanks Bob – (see http://www.paraglidingforum.com/leonardo/flight/738431) – could we possibly be on for three out of three? On Monday we took the gondola up to Planpraz in the Chamonix valley itself with the vague plan of flying open distance to the east into Switzerland, however once we’d taken off and made a little foray up the valley to Flegere it was clear that there was so much snow around that going up the valley wasn’t really an option. Also, there was a reasonable breeze from the SW and we didn’t want to get a way down there, decide it wasn’t going to be any good then be unable to get back. Loitering around above Planpraz waiting for Pete to take off. 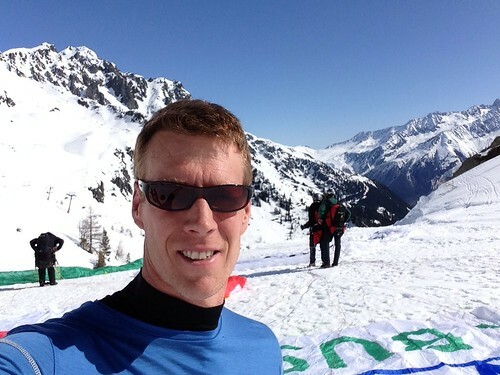 Once out of the Chamonix valley I headed towards the Lac Vert near the Plaine Joux takeoff and was getting a bit low before I found a lovely 3-4m/s climb which took me from 1700m right up to 2750m… Loverly jubberly! I didn’t loiter at the cliffs but instead headed straight for the Tete du Colonney where I climbed to 2,700m again before following Guy over the Sallanches valley to where we climbed out yesterday. Guy was ten minutes in front of me by this stage, and Pete was some way behind so I did my own thing for a bit before heading back to the Tete du Colonney in a big loop. 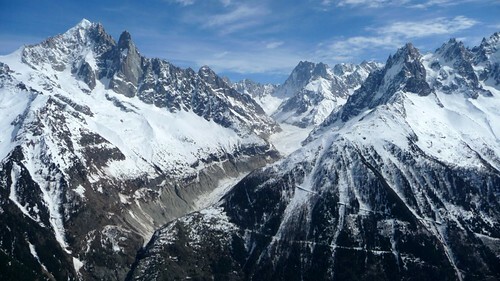 Later I met up with Guy again and we crossed the valley for a third time over to the Tete Noire and Le Prarion. We continued heading south to Mont Vorassay which is the start of the now famous August “run” up to Mont Blanc. We didn’t have the height at this stage to hop straight over the back into the Chamonix valley so we flew north back up to Le Prarion, topped up, then went over the back. I got flushed down to 1500m but found a nice climb again which saw me climbing up in front of Planpraz where we had taken off 3.5 hours earlier. So that was it – a third fantastic day (http://www.paraglidingforum.com/leonardo/flight/738432) bringing a total of 180 “XC” kms flown and just about 13 hours in the air. Not bad for a spur of the moment plan! We left Gavin’s chalet at 1030 the following morning and I was back at home by 1430 – amazing, and slightly unreal! 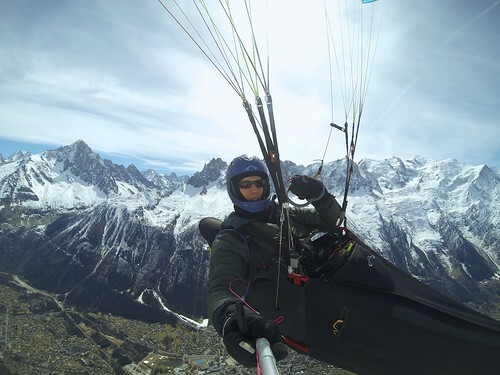 If you’ve got this far in the story then your reward is a short video showing some of the highlights of the flying in this stunning part of France… Enjoy! Thanks to Pete and Guy for coming with me at such short notice, to Gavin for giving us a good deal at his lovely chalet, and to his wife Sue for the wonderful breakfasts each morning, to Mike for lending me his GoPro, to Ken for lending me his Easyjet sports equipment surcharge busting bag and finally last but not least, thanks to my wonderful wife Lisa for letting me disappear off for four days, although after the moping around I had done earlier in the week perhaps she was glad to get rid of me! ~ by Tim Pentreath on April 23, 2013.